You are about to apply for an STSL account, allowing you to book films on a title-by-title basis, either on a Commercial (to a paying audience) or Non-Commercial (free of charge with or without external advertising). A £150 refundable holding deposit is required. Please have your credit/debit card to hand before you begin this application. The system will time-out if left idle for 15 mins. You can also select BACS or cheque payment options. For more information regarding the next stage after your online application, please visit our Setting Up An STSL Account section. Follow these five simple steps to set up an account and start screening films. Select the Apply Now option to launch a browser window providing you with access to the Filmbankmedia online bookings system. You will receive confirmation of account approval from 24 hours after your initial account set up (exc. weekends). * After your account has been approved, you will receive your online login details via email followed by a second email containing your Filmbankmedia Welcome Pack. * Please note depending on your method of payment this timeframe may differ. You are now ready to book your first screening! 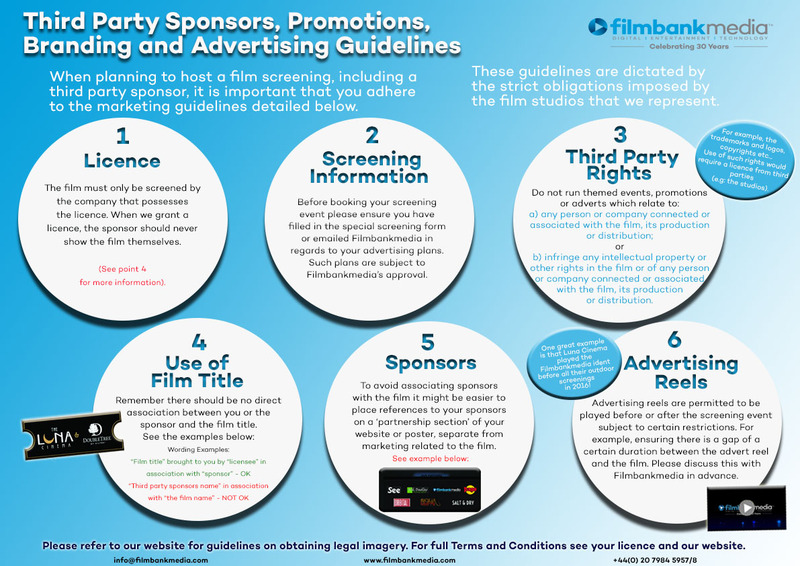 Your Filmbankmedia Welcome Pack contains an STSL Guidelines Handbook, providing you with a full breakdown of how to place your first booking as well as any other questions you might have about how the licence works. All that remains is for you to select a film to screen! Our extensive film library contains more than 15,000 films with entertainment dating back to the 1920s and spanning all genres and audiences. Apply Now to set up your Single Title Screening Licence account today!